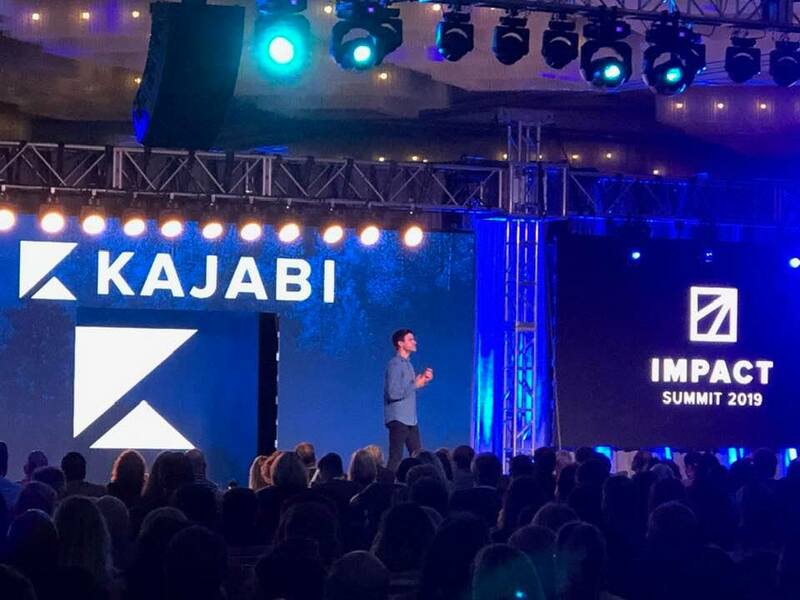 As the Kajabi Impact Summit began on Friday, April 5, 2019, the co-founder and owner Kenny Reuter welcomed the huge crowd. He talked about how Kajabi started and what it has grown to today. Then he introduced the following members of his Kajabi team to tell us what Kajabi has been up to already this year and what else is coming in 2019. Items in parentheses are my own thoughts or added notes. 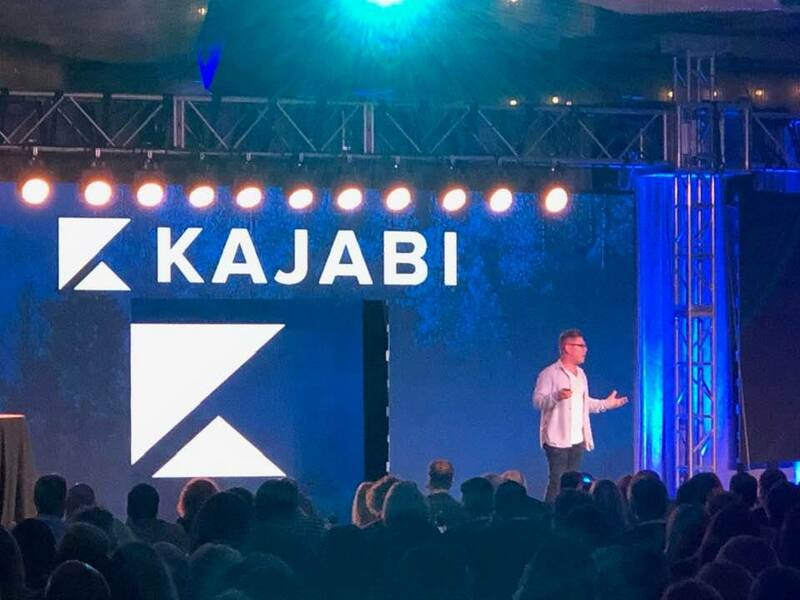 Kajabi wants us to build businesses the way that we want. Earlier this year, they added a way to engage with our audience in deep, impactful, transformative ways. It's a new digital Product in Kababi called Community and it's like a Facebook Group but one step further. 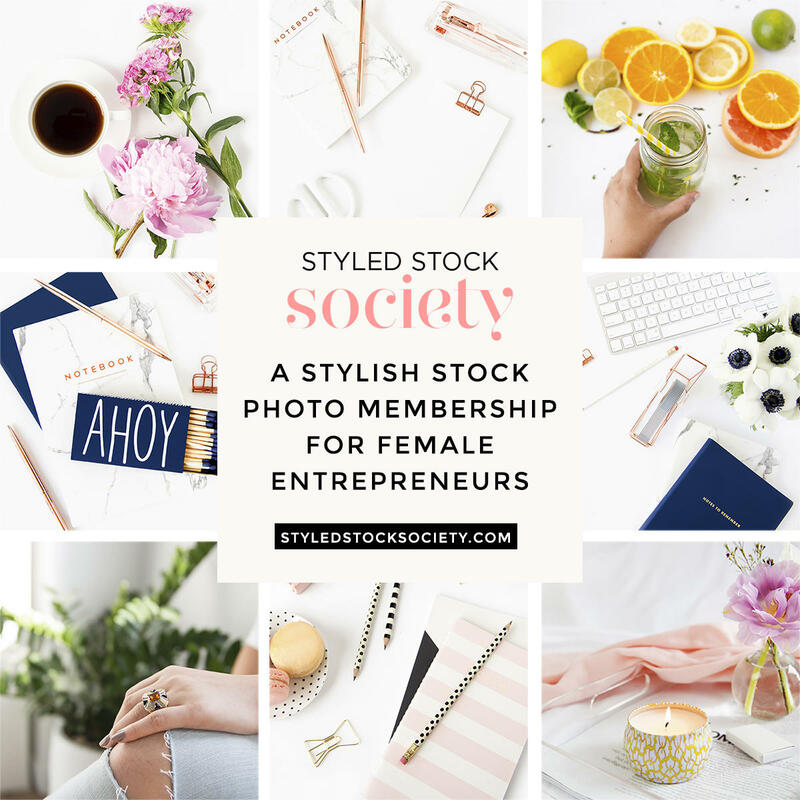 Community is not just a place our people can go but we can also sell that transformation as a Product, add on to an existing Product, make it a standalone or a subscription. With Community, we can sell the idea of community and transformation (which are SO important to course and membership providers). Since Kajabi rolled out Community earlier this year, early adopters have already had 150,000 interactions with their people, experienced more engagement with their audience, more interaction, and the most transformation than anywhere else on the internet. It's in your dashboard today! (Go to Products, New Product, Community). And Kajabi doesn't stop there. The believe in Kaizen, the Japanese term for improvement; in their culture and their products. Jeremy invites us to continue improving one baby step at a time. Website and Branding - They're our home base, so Kajabi wants to give us all the tools we need to build a brand. Analytics - They want to provide us the answers to critical questions like how are my offers doing against each other and in the marketplace, etc.? Page Builder - The goal is to help us design the brand we want. The Premier theme was introduced almost 3 years ago, and we got a lot of mileage from it - pipelines, landing pages, websites. From Premier, they've been collecting knowledge and applying to it to a new family of themes and a new page builder called Encore. It's the Premier successor, using much of same design philosophy and is easy to use but it'll have more power and flexibility. When will Kajabi's new Encore theme be released? Per Jeremy, "Later in 2019." 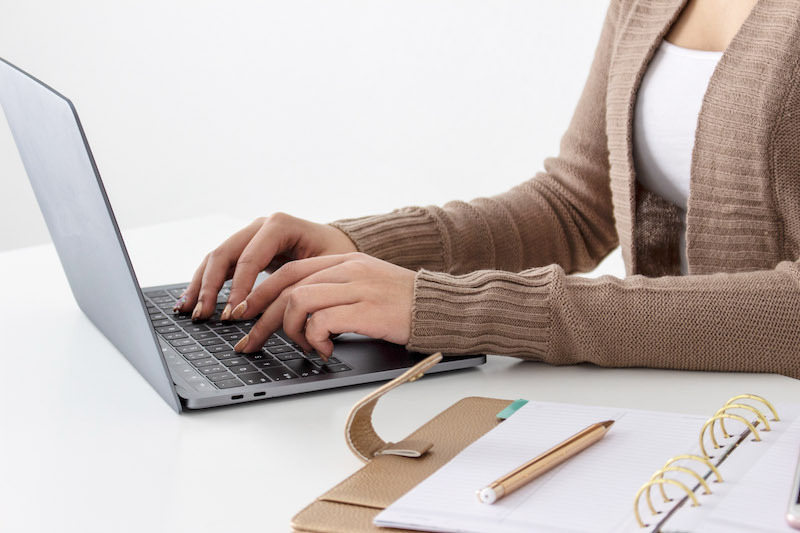 Taxing Sales and Tax Reporting - It's April so many of us working in the digital realm are thinking about and prepping for taxes. Kajabi wants to make that easier for us. They'll be introducing collection and reporting of sales tax; charging, tracking, including VAT. This will apply to Canada, Australia, the US, and Europe. For now, Great Britain is unknown (ha ha). Kajabi will collect sales tax automatically based on postal code and they're working with 3rd party partners to get reporting at the click of a button. Marketing/CRM - Kajabi will be improving email marketing and automation on the platform. The focus will be on improving the core experience with more practical automation. Kajabi will be talking to us, their customers, to see what we need. (I've seen Kajabi do this several times with other topics. They reach out to customers and ask us to schedule a call to discuss how we use a feature and what changes/improvements would be helpful. I love that they ask us!). There will be more ways to segment customers and more ways to engage our audience with a next gen email editor including design templates. We'll be able to personalize email design to what matches our brand, optimize for sends/opens, go into underlying code (as with the rest of Kajabi) and tweak it to be more minimal, or whatever WE want. Other - There will be hundreds of tiny updates, improvement, tweaks, bug fixes, and things that fix current pain points. (I've seen Kajabi do this a lot as well. There won't be any big announcement but one day you're in your account and realize, "Hey! That feature wasn't there before - cool!"). Kenny will talk more about it later but it's about customer success, teaching us, and empowering us to run our businesses. Kajabi is pulling that more into the dashboard, and there will be more ways to engage with the content Kajabi provides. Announcing Kajabi's' very first mobile app! We'll be able to participate in a broader Kajabi community. 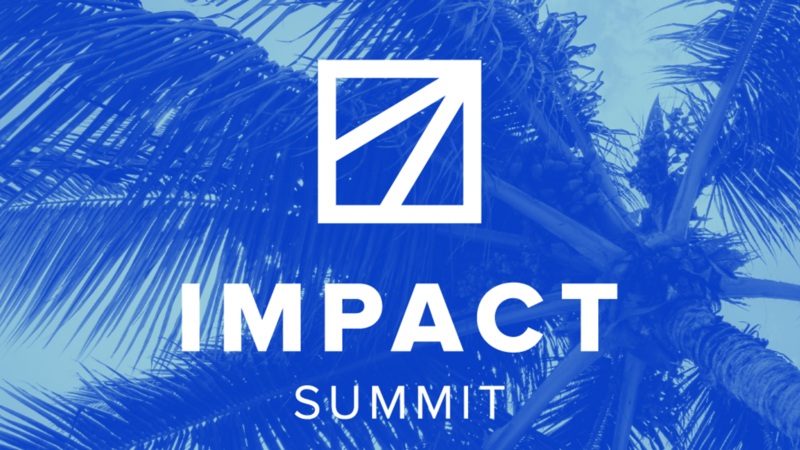 For instance, Jeremy pulled up the Impact Summit Community on his iPhone and asked if anyone at the summit wanted to join him for dinner :). With the Hero University mobile app, the Impact Summit community can engage with each other throughout the event. 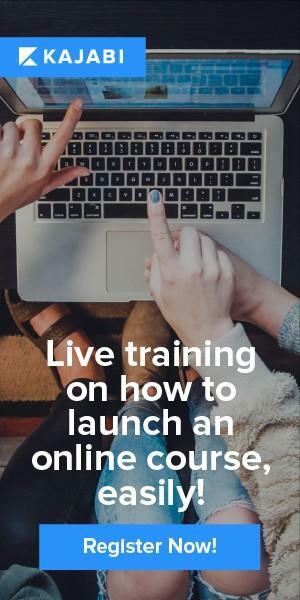 With the mobile app, we can also jump into courses like Marketing Mastery and pick up where we left off - play videos, leave comments in a course Community, etc. It's available iOs and Android now - download it now - Hero University App! (I downloaded the app. At this point, it's a bit confusing. 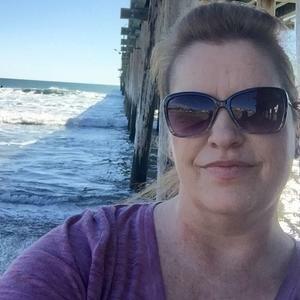 The app is called Hero University but once logged in, it shows all my Hero University courses PLUS the "Impact Summit Community" and "Impact Summit 2019". So I'll have to play around and figure it out. I guess I don't understand why the app isn't just called Kajabi App or something more general). What if you had your OWN apps? Kajabi is pleased to announce your own mobile app - all your courses in your customers' pockets with no extra work. It's coming to iOs and Android "this fall." The app that Jeremy showed, you'll now have for your own business; doesn't have to say Kajabi on it. After making some self-deprecating jokes about people being disappointed when "Brendon at Kajabi" means him and not Brendon Burchard ... 😂 He said lots of very techie stuff but long story short, Brendon demonstrated how they've improved and will continue to improve things like site speed, reliability, security, load time, page performance, etc. If you want to geek out on tech specifics, here ya' go. If not, just skip down to the next "Kenny Reuter" heading :). One goal is to speed up email broadcasts to near instantaneous. Kajabi cares deeply about infrastructure. Others sell something shiny, do a great job at selling their platform but under the hood it breaks down, is slow, etc. But Kajabi has a world-class development and engineering team - meticulous discovery process, and QA to make sure it'll work in the all-in-one environment; they care deeply about that. We as customers should only need to care about offers and content. Things need to work so they don't want inconsistency to get in the way of that. When a customer buys your offer then comes back to a different experience - they don't want that for us. HPH is how they achieve that level of consistency. They choose to double-check all code - 1 writer, 2 checkers - which is like having a proofreader and editor on a book you write. They do automated tests as if a user - also some manual QA. There's Forest whose primary job is to find friendly ways to break things before it gets to us. Automated tests - (his favorite slide): There are 17,000+ automated tests in Kajabi. It's what great software development shops do though it's unique overall. It would take a person 12 days with no sleep to run the tests but they run it automated 5-10x/day and it only takes 15 minutes. Brent, an engineer who flew in from Florida, focuses on speed, reliability, consistency of software; Kajabi is concentrating on that more now than ever. This year, they put up a status page: status.kajabi.com and strive for transparency. Go here if Kajabi is down for you to see if it's Kajabi or something else (your browser, internet, cache, etc.). Another recent improvement was that video stats were added. Videos are the highest traffic portion of the application; every few seconds in the background it's saying I'm here, I'm here. Katie just made it 25% faster. Katie and Amy upgraded some other core components. The database upgrade we remember from about a month ago (we got a warning message) - they always try to pick a lower traffic period but it's challenging with a global audience. He thanked customers for our patience. It was worth it; it improved performance 3X. It was performing fine but they were thinking to the future. It smoothed out some inconsistencies. Basically, they went from a Ford Mustang (already a very nice car) to a Ferrari at the core of Kajabi. Improved page performance - Pages have the 2nd or 3rd highest traffic of Kajabi. The improvements made things up to 60% faster on some pages - thanks Brent! There's now a smoother deployment = less waiting when your customers go to buy. 1. The answer to "should we hire this person?" needs to be a "hell yes!" or it's a "no." 2. Don't let ego make you defensive - hire people who are smarter than you. The new team structure - much smaller teams (see list above) which will increase communication within the company. For example, things could go from FB group question to moderator Joe to making it a feature or improvement. Kajabi is for people who are serious about their business. Now it's time to discuss the 3rd prong in company - product, infrastructure, and now the success of our members (it's Kajabi's number one value). Tony wants us to know that he's human, not a robot. He has digestive issues, anxiety ... 😂 (dude is hilarious; catch him in a FB Live sometime on the Kajabi Facebook Page). When Kenny started, he had his family and friends including his dad answering support tickets. Years ago, when Tony started, they answered 30 support emails a day. They now have Kajabi customers in 120 countries and 40+ customer support peeps around the world, many working in the Hero Hub this weekend at Impact Summit. Kajabi now handles 600 emails and 500 chats per day! They need more people and better training. The Foundations course was created as employee internal training, then they saw value and shared it with us. Every button you can push in Kajabi has a help file. With new customer onboarding, you get 30 minutes with them x 50/day = 1500 minutes per day. After handling support tickets for 6 months, the most common question by far was ... how to change the instructor info on a post, where is it?? (This elicited a big laugh from the audience, as it's also the most common question in the Facebook group). Tony feels that Kajabi is your golden ticket. If they give us the wrong answer, they affect our business. "You put all your cards with Kajabi" so they're putting all their cards with us. The plan is to quadruple support by the end of the year so we can have a smoother, quicker experience and spend more time with our families and doing things we love. Current response time is 2 hours average for emails and 2 minutes average for chat. In customer satisfaction, they topped the industry at 97% (the industry standard is 95%). They did have more than 10x the emails than any other company in their space ... which can sound good but is NOT a good thing. They need to figure out how to lower that amount. They've already done a pretty good job of cutting down support response time and increased the satisfaction rate (with the exception of that recent snafu). They're coming out with new version of Hero University. Kajabi learned from the Marketing Mastery course that we're willing to invest our time/money to learn. They plan to release a load of free content in all the areas we've been asking for - marketing, FB ads, and more. (Kajabi Chief Revenue Officer Kevin Richards has already been in the Facebook Group asking our thoughts surrounding FB ads). Also looking at proactive support - answering our questions before we ask them. When they notice trends in customer behavior, they're tracking our actions, trying to predict what we're trying to do, and hopefully next time, popup with a solution. They'll also be improving the Kajabi Foundations course. Text and phone support is coming this year! When you need urgent help in real life, you don't email people - you text or call. Tony did a demo on his phone where he texted "I need some help with my landing pages. Can you help me?" and the response was "Happy to help. Would a phone call be better?" It's time to set new standards of customer success - meet the market where it is. They'll be doing their job so we can do our job. With those 3 prongs of attack, Kajabi has illustrated that they care and want us to be successful. Kajabi is not just a platform but a way of thinking, a way of life, a community of like-minded people. He reminded us that no one we'll see presenting here was an overnight success story. But you have to get going, do something; it can evolve and turn into something bigger. The numbers have shown that a person who makes $1K on Kajabi is 100x more like to reach $37K and once you earn $37K, it's exponentially more likely you'll earn $100K. So stick with it. I hope you enjoyed hearing about all the feature updates and improvements by Kajabi so far in 2019 and those still to come through the rest of the year! Personally, I was thrilled to hear about the road map. It helps me with not only making concrete plans based on expected features but also just to dream about what's possible with a company who has such exciting plans for their members.